As Democrats warned Roe v. Wade is at stake in the fight over Justice Anthony Kennedy, a Republican downplayed the risk. WASHINGTON — As Democrats look for ways to slow down President Donald Trump's pick to fill a vacant seat on the Supreme Court, Sen. Maria Cantwell, D-Wash., warned her colleagues on both sides of the aisle that the upcoming confirmation vote could be "career-ending" if it leads to the overturning of Roe v. Wade and other major precedents. 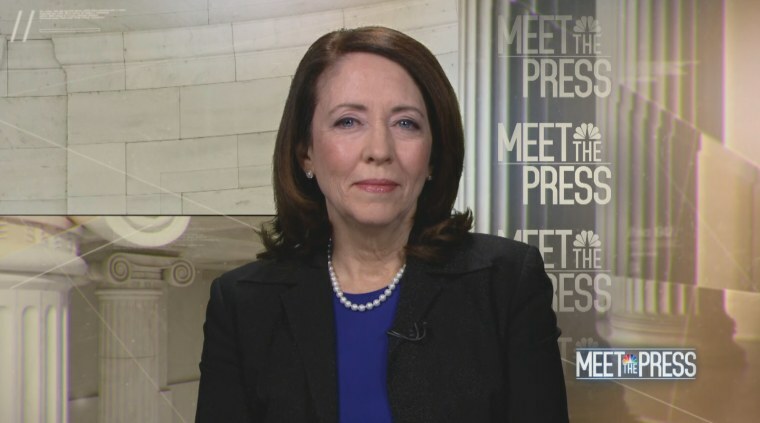 "My colleagues on both sides of the aisle know that this vote could be one of the key votes of their entire career," Cantwell said in an exclusive interview on NBC News' "Meet the Press" with Chuck Todd Sunday. "If they vote for somebody who's going to change precedent, it could be a career-ending move." Trump has the chance to change the trajectory of the court after Justice Anthony Kennedy, the perennial swing vote, announced his retirement last week. During the 2016 campaign, Trump said he would appoint nominees who would overturn Roe v. Wade, an act that could make abortion illegal in a score of states. With little recourse to stop Republicans or even slow the process, Democrats are hoping to pressure pro-abortion rights Republicans like Sen. Susan Collins, R-Maine, to vote against any nominee that would threaten Roe v. Wade, the landmark abortion ruling. Collins said Sunday on CNN that she would not support anyone who is against the Roe v. Wade ruling. "I would not support a nominee who demonstrated hostility to Roe v. Wade because that would mean to me that their judicial philosophy did not include a respect for established decisions, established law," she said. Cantwell said her party's strategy was to "speak out" about how a new conservative justice could fundamentally change the court. Trump is expected to announce his nominee July 9. "This is a very different Supreme Court discussion, because everyone in the United States Senate who is going to go vote on this knows that it will change the balance of power," Cantwell said. "So you're not just voting on whether Trump should have his nominee, you're voting on whether that nominee is going to change precedent." Trump said Sunday that he would "probably" not ask his Supreme Court pick how they would vote on the Roe v. Wade legal precedent during an interview with Fox News. But he added that abortion rights "could very well end up" being determined on a state-by-state basis after his pick is confirmed. Alexandria Ocasio-Cortez, who beat a senior House Democrat from New York in a primary last week, called on Democrats to stiffen their backbone on the court fight. "The messaging isn't as clear to the communities that we're trying to represent," she said. "Are we fighting, or not?" But Sen. Lindsey Graham, R-S.C., who was also interviewed exclusively on "Meet the Press," downplayed the potential impact on abortion rights. "This is not a referendum on Roe v. Wade," Graham said. "One of the concepts that really means a lot in America is stare decisis. That means you don't overturn precedent unless there's a good reason. And I would tell my pro-life friends you can be pro-life and conservative, but you can also believe in stare decisis. Roe v. Wade, in many different ways, has been affirmed over the years," Graham said. Meanwhile, with the potential for a criminal case involving the president or people around him coming before the Supreme Court, Graham said he does not believe the next justice automatically needs to recuse themselves from matters involving Trump. "I've been a lawyer before I was a politician. To recuse yourself is proper in some cases," Graham said. "But the idea that you can't judge somebody who picked you is probably not a ground for recusal. You've got to show there's a connection between the case at hand and the activity of the judge." He did, however, push back on Trump's call for the Senate to abolish the 60-vote threshold for legislation, which the president reiterated in a tweet Saturday. Republicans lowered the threshold to a simple majority for all judicial nominees last year by defanging the filibuster, following a similar action by Democratic Senate leaders on executive appointments when they were in power. "I'm never going to do that. I'd rather lose my job than turn the Senate into the House," he said.